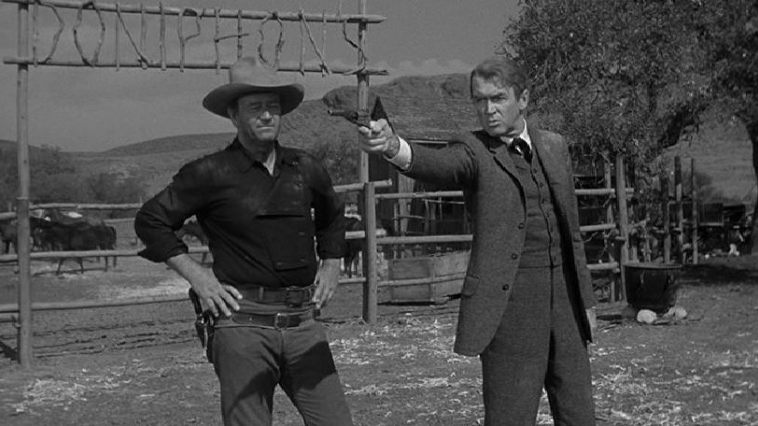 Based on the short story by Dorothy M. Johnson, The Man Who Shot Liberty Valance is the story of an attorney whose encounters with a notorious outlaw has him teaming up with a gunslinger to deal with him in order to protect the people at a small town in the West. Directed by John Ford and screenplay by James Warner Bellah and Willis Goldbeck, the film is an exploration of two men with different ideas of the world who team up to face off against someone who just wants to bring chaos into the world. Starring John Wayne, James Stewart, Vera Miles, Lee Marvin, Edmond O’Brien, Andy Devine, John Carradine, Jeanette Nolan, Woody Strode, Strother Martin, and Lee Van Cleef. The Man Who Shot Liberty Valance is a grand yet evocative film from John Ford. The film is essentially a reflective story in which a senator recalls a time in his life when he was just an attorney arriving into a small town in the West where he tries to stand up against a notorious outlaw where he later teams up with a gunslinger and a few others in making a stand against him. Especially as he would later become a pillar of hope in a town that is still ravaged with fear prompting this attorney from the East to make a difference. The film’s screenplay begins with Ranse Stoddard (James Stewart) and his wife Hallie (Vera Miles) arriving to the small town of Shinbone as the local press wonder why he’s there. He then tells them the story of how he first came to the town 25 years earlier where he would meet Hallie and stand up to the outlaw known as Liberty Valance (Lee Marvin) after trying to stop him from robbing a widow during a stagecoach robbery. After being healed by Hallie and a local rancher in Tom Doniphon (John Wayne), Stoddard would do whatever he can to help the town. Stoddard is a man that is educated and isn’t willing to be violent as he is trying to make sure there’s some law and order in this small town he’s arrived in as he also wants to be there for the people whether it’s to defend them in a court of law or teach them how to read and write. He would live at the restaurant that Hallie works at while doing his law practice at the local newspaper run by its publisher Dutton Peabody (Edmond O’Brien) who would befriend Stoddard as they would team up for an election on statehood. While Doniphon appreciates what Stoddard is doing, he feels that Stoddard is also just making things troubling because of Valance who wants to maintain his own power by beating up anyone or kill someone. Doniphon is a no-nonsense man who can read and write but knows how lawless the West can be as he is the only man that can out-gun Valance. John Ford’s direction is definitely rapturous in terms of some of the visuals he creates as well as the fact that much of the story is told in a reflective manner by Stoddard to a journalist. Shot on the studio backlots at Paramount Studios in Hollywood, the film is more intimate in terms of its location even though there are a few scenes set in the desert as much of it is shot at a soundstage as the fictional town of Shinbone. While there are some wide shots of some of those locations, Ford would emphasize more on close-ups and medium shots for much of the film as it relate to the intimacy in the story as well as capturing some of the conversations and moments with the characters. Notably in the scenes that show Stoddard doing all sorts of things whether in educating some of the locals, cleaning the dishes at the restaurant where he’s staying at, or looking at Peacock’s articles. While much of the film is dramatic with some suspense, Ford would infuse the film with bits of humor such as a scene where Doniphon would show Stoddard how to shoot a gun as it would reveal how tough Stoddard really is. As for some of the action, there are moments where the violence is quite brutal such as the Stoddard’s first encounter with Valance where Valance would whip him such a visceral way. The scenes where Valance is around is always filled with dread as the man is quite unpredictable as he would just scare people with his presence or through his violent actions. There is a showdown that would occur between Stoddard and Valance but it’s a very unusual showdown early in its third act. Notably as it would be followed by its aftermath as it relates to not just what happened to Valance but also who shot him as it would create this myth that is very unsettling. Overall, Ford creates a mesmerizing yet intense film about a lawyer and a gunslinger standing up against a notorious outlaw. Cinematographer William H. Clothier does brilliant work with the film’s black-and-white photography from the sunny look of the daytime exteriors to some of the stylish usage of shadows and shades for some of the interior/exterior scenes at night. Editor Otho Lovering does excellent work with the film’s editing as it has some stylish rhythmic cuts to play into the action and suspense as well as some straightforward cuts for the drama. Art directors Eddie Imazu and Hal Pereira, with set decorators Sam Comer and Darrell Silvera, do fantastic work with the look of the saloons, restaurants, and Doniphon’s ranch as well as the interiors of some of the buildings in the film. Costume designer Edith Head does nice work with the costumes from the look of the hats and clothes the men wear to some of the dresses that Hallie wears. Sound recordists Charles Grenzbach and Philip Mitchell do terrific work with the sound as it play into raucous sound of the meetings as well as in some of the moments of suspense as it relates to the showdown between Stoddard and Valance. The film’s music by Cyril J. Mockridge and Alfred Newman is wonderful for its mixture of bombastic orchestra music with its large brass arrangements and string flourishes for some of the dramatic moments as the score also include some folk-based music of the times. The film’s superb cast include some notable small roles from Denver Pyle and O.Z. Whitehead as the father-son duo of Amos and Herbert Carruthers, Willis Bouchey as a train conductor, Joseph Hoover as a journalist interviewing Stoddard in the film’s beginning, Jeanette Nolan and John Qualen as the Swedish immigrant couple in the Ericsons who work with Hallie at the restaurant, John Carradine as a speaker for a convention representing those in favor of territory rights, Ken Murray as the local doctor Doc Willoughby, Strother Martin and Lee Van Cleef as two of Valance’s henchman in their respective roles as Floyd and Reese, and Woody Strode as Doniphon’s ranch hand Pompey as an African-American that is very helpful as well as wanting to be educated by Stoddard. Andy Devine is terrific as the local marshal Link Appleyard as a man that has a hard time upholding the law as he’s afraid of Valance as he is kind of the film’s comic relief. Edmond O’Brien is excellent as Dutton Peabody as the local newspaper publisher who is full of gusto in the things he says while admittedly being a drunk but a man that can rile up Valance through his words. Vera Miles is amazing as Hallie as a local woman who runs a restaurant as she is courted by Doniphon as she would fall for Stoddard whom she sees as a man that can help her as well as make her into something more. Lee Marvin is brilliant as Liberty Valance as a brutish outlaw who likes to wreak havoc on the people as he tries to assert his own power and whatever he can to play into his role in the West. James Stewart is incredible as Ranse Stoddard as an attorney who is trying to help the locals in the small town as he also stands up to Valance where he is forced to see what he has to do to deal with him. Finally, there’s John Wayne in a phenomenal performance as Tom Doniphon as it is a performance where Wayne display some charm as well as humility as a gunslinger that is the one person that can deal with Valance but also is aware of what Stoddard is trying to do for the town as he would take action that would prove to be catastrophic for both men. 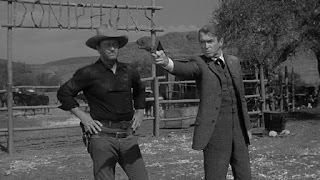 The Man Who Shot Liberty Valance is a sensational film from John Ford that features great performances from John Wayne, James Stewart, Vera Miles, and Lee Marvin. Along with its dazzling visuals and a compelling take on heroism, it’s a film that explore what some will do to help people not be afraid from the presence of an outlaw but also into the myths of the West. In the end, The Man Who Shot Liberty Valance is a tremendous film from John Ford. I ought to rewatch this one. Lee Marvin sure is one mean villain! @Chris-Damn straight he is. Lee Marvin rules.